In September 2013, Israeli start-up company OrCam released the OrCam visual system to help the 300-million visually impaired people in the world “see.” OrCam is a portable device that is similar to Google Glass, composed of a camera and a small computer about the size of the typical glasses case that uses augmented reality. The device attaches by magnet to users’ glasses. OrCam is able to recognize text, products and even familiar faces. At the push of a button or a point of your finger, OrCam recognizes objects, and will read you information through the bone conducting earpiece. This device has a transducer that converts electric signals into mechanical vibrations which sends sound to the internal ear through the cranial bones. This makes the audio discrete so others do not realize you are receiving assistance. Through extended use, OrCam will recognize your personal objects such as credit cards, money notes, friends, favorite products, and more. Using this device helps the visually impaired to become more independent and relaxed about interacting with the world. This product currently sells for $3,500. There is a possibility for reimbursement if it is covered by your vision insurance plan. Some vision insurance plans, usually premium plans will have limited funding for assistive devices. Most of the time this reimbursement is on a case by case basis. There are grants that you can apply for that you can use toward the cost of the OrCam device. As with many new technological advances, this device has some faults. First of all, it is only available in the United States and the only language it supports is English. As this product advances the company hopes to make it capable of translating language and available to a wider audience. The OrCam does not recognize handwritten text. The greatest improvements in medicine in the last few decades have been made possible by advances in technology. Today new personal and mobile technologies are just beginning to allow us to take charge of our own health and medicine. Smartphone apps compile data and provide solutions, and wearable technology such as fitness bands track movement, heart rate, and more. But this is just the start of a new wave of tech gadgets and apps that will revolutionize how we care for our bodies. 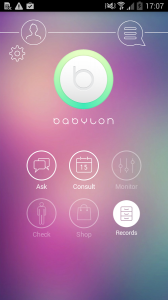 The sophistication and widespread availability of mobile technology for all aspects of healthcare are about to take off, and this advanced tech will help us to take responsibility for our own health. Mobile apps that help you count calories, lose weight, get fit, quit smoking, track your alcohol intake, or manage a specific health condition are already available and in use. 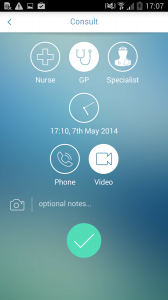 Current wearable technology for healthcare includes fitness bands that track steps like Jawbone UP and Fitbit Flex, the Withings Pulse O2 which combines a pedometer with a heart rate and blood oxygen monitor, and Google Glass—which, among its myriad of uses, helps doctors to see more patient data in real time, hands free, and allows surgeons to better perform minimally invasive operations requiring reliance on imagery. Some of the new and upcoming wearable technologies that are focused on improving health sound strange, but are currently under development: a shirt that detects irregular blood sugar levels, contact lenses that monitor changes in the retina, and intelligent fibers in clothing that keep track of your pulse, breathing, and heart rate. Other developments on the way include a smart sock that keeps track of people with Alzheimer’s disease, a skin patch that provides hypodermic injections throughout the day, and Digitsole—an insole that connects to a mobile device allowing you to adjust the temperature of your shoes, track activity, and also help adjust your posture. You know you’ve hit the big time when the television show The Simpsons is covering your product. This past week the Simpsons did a spoof on Google Glass. One of the funniest lines is when Homer takes off his glasses and screams, “oh, reality!” Now, on a serious note Marge, the mother in the show, ends up wearing the glasses and Homer has a chance to secretly watch her. He does (I’m not giving anything away here). The show brings up the idea of what is public and what is private in a clever way. Check it out! Wearable Media as a Human Right? 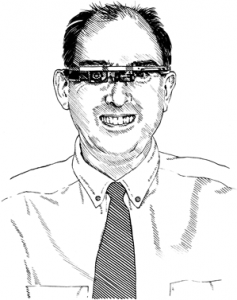 This past week Steve Mann from the MIT Technology Review wrote an article titled Wearable Technology as a Human Right. I took umbrage with the article. Mann is well known in the Wearable Media arena because he founded MIT’s wearable computer project more than 20 years ago. His argument centers around the idea that wearable media is not just a matter of fashion, but also of function, which means it should be a human right for people to use this media wherever and whenever they want. He’s not writing about the Nike’s FuelBand fitness tracker he’s writing about technology that helps people recognize faces or serves as a memory aid. He’s concerned that people who use this technology, let’s say Google Glass, to help them are being banned from certain places. Though he doesn’t mention this specifically in several states casinos are banning people from wearing Google glasses. The idea is that the glasses would help poker or card players cheat while playing the game. This may seem harmless, but he asks what about people who are wearing the glasses in a bar or restaurant and get kicked out because of the technology? He writes that …we must balance [people’s] rights with their desire to allow other people privacy and confidentiality. Here’s the so what – he and I differ. I agree there must be a fine line between privacy and freedom to wear what you choose, but with Edward Snowden’s admission of NSA spying when are we, citizens, going to get a break? I think I have a right to walk into a store, restaurant, or spa and have some expectation I won’t be recorded by individuals. I have accepted that these places are recording me just in case I steal something, but I’m not ready for some random guy to record me selecting Wheaties over Bran flakes in my local grocery store. What exactly is wearable media and who wears it? This hypertext nugget is trying to school you who have no idea about wearable media, present company included. So I thought I would help break down the graphic for you. First, Wearable Tech, the graphic gives a solid definition of wearable tech, but let’s throw an example out there like the Nike fuelband. The Fuelband tracks numerous things going on in your life such as how many steps you take, how many calories you expended and when to call your mother – I am totally joking about the last part, but I bet with a little coding they could do it. According to article about wearable media, The Rise of Wearable Media, more than 8 million Brits wear some form of wearable tech. Apparently, the more media we wear, not consume mind you, the more intelligent we feel we are. If I am looking down on you with a pair of Google glasses you are in for it – it’s smarty pants time. Since I have the glasses on you’ve automatically lost. Game over. This article and chart cover so many wearable fashions such as: 3D printed shows, Apple iWatch, Intamacy 2.0 Dress (you look that one up yourself) and numerous other devices. My concern is not that we’re all wearing body enhancement devices, but what are they saying about us as consumers. Do I need a twitter dress that shows users’ tweets? Maybe? Are we building art? But in my lowly life as a graduate student I KNOW I want the Anti-Paparazzi Clutch Bag. It reflects light from camera flashes to obscure users from paparazzi. I want to obscure the fact that I’m Sasquatch since I come out of my house every few months and I’m blind people by my lack of tan. Here’s the so what. As the wearable technology fashion starts to gain in popularity it is time for us to look at what good this technology will do. 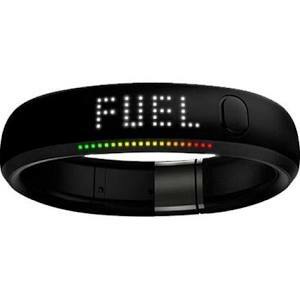 Can we use the Fuelband to help track people with diabetes (if they choose) to make sure they are taking in the right amount of glucose and producing the right amount of insulin. 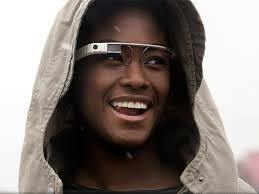 Can we use Google Glass for the soldiers and SWAT members who’s job it is to take apart bombs. These glasses would give the soldiers a chance to give real time pictures to support tactical units to help out. Or what if the twitter dress existed for the Arab Spring. One person could protest by sending out messages to people all over the world wearing a twitter dress or pants or scarf. And the paparazzi clutch? Well, use it as a paparazzi clutch. Wearable media. Will you wear it? 2012 and 2013 has been an interesting time period for the development of technology into fashion, specifically with the development of Google Glass. Although, outside of the sporting good market where else have we seen advances in technological fashion to your mass markets? At a whopping expected price point of $1,500 who exactly does Google think they are marketing to? Currently Google has a lead in the advances toward incorporating “computers” into fashionable items in the accessory market. Apple has also been rumored to be coming out with iWatch which is again in the accessory market. We have yet to see advances in the Ready To Wear market outside of the health and fitness arena. Techno Fashion by Bradley Quinn was published in 2002 and references the i-Wear project which was a production of prototype garments. This project was experimenting with making clothing that used laptops, mobile devices, and batteries which we are just now starting to see with the development of these new “smart” fashion pieces. So from 2002 to 2013 we haven’t made any leaps and bounds towards the mass market having access to this kind of “i-Wear” that De Brouwer and his team were working on for a span of five years but is Google Glass about to bridge this gap? Much like the Apple fanboys Google has a strong following and they may have the brand power and hype on their side to make this technological advance stick around. While they clearly are not at a point to bring the cost to a more consumer friendly place they sure do have enough hype around their product. Currently the product is in the hands of thousands of developers and will soon be out for an “everyday” consumer to purchase…of course an everyday consumer who has $1,500 lying around to purchase on a gadget that may or may not stick around. The question that I would like to pose is, are we at a point were people are ready to rely less on their phone and more on an item of “fashion”? Phones over the past decade have taken a place in our society as a statement of wealth and also a fashion statement. We have come a long way from the brick phones from the 80’s to the newest iPhone 5’s sleek design. So many people base their status in society on what phone they carry that are we ready to make the jump to glasses or a watch that will make a phone almost useless besides for its original purpose, to make phone calls. It can be easily seen every time Apple comes out with a new iPhone that this piece of hardware is so extremely important that people will wait for days in line just to be the first to have one. It has yet to be seen how Google will market this item to the mass public but it will be interesting to see if your average customer will want to try them on. In an article from Mashable.com they referenced an infographic from footwear retailer Brantano that seems to be quite useful in this discussion.